There are many occasions where you feel the need to renovate some aspect of your home. A renovated house can make you feel as though you have transported to some other place. Every year, Americans spend great amounts of money to change the design of their homes. This is because we have a tendency to get bored with every day. We want to eat different foods and watch new movies. This psychology has us always working toward positive change and growth or expansion and there’s nothing wrong with that. You might have heard the saying that “change is the rule of nature”. Yes, everything changes. A redesigned house with fresh doors and energy-saving windows, or a new kitchen with a pantry and lots of surfaces and light can make you feel refreshed, energized and hopeful. By renovating a positive environment in your home, you will naturally feel more relaxed and happy. The question that many people have though is which contractor to choose when it comes to renovation. Monster Contractor has decades of combined experience in exactly this field and offers the best home remodel service in Elk Grove. At Monster Contractor, we know the proper remodel design, plan, and preparation are essential to every bath, kitchen or other addition or remodel. When remodeling your Elk Grove home, you need the process to go smoothly. This is what Monster Contractor wants to create for you. Step #1: Create a mental picture. Every process in the world requires that initial dreaming stage. Without a proper plan, everything fails, but without the dream you’ll never even get to the planning stage. To paint a picture, an artist needs an idea. In the same way, to renovate your home, an architect needs to understand your vision. As the best contractor to offer Home Remodeling in Elk Grove, we make the needs of our clients our top priority. Start visualizing your final product. 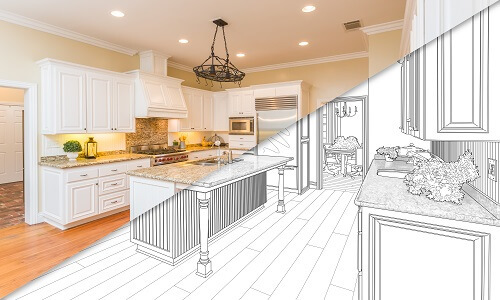 We want to know what you are expecting your kitchen, bath or addition to look like after the remodel is complete. Perhaps you want to combine bedrooms in order to create a master suite. Monster Contractor Remodel has the expertise you need. Do you need a whole house remodel? If you bought a plain-wrapper or fixer-upper home, you could really benefit from the Elk Grove Monster Contractor Remodel team. Start collecting images of baths or kitchens or other aspects of the project that you have admired in Elk Grove. Consider even the smallest aspects like the type of baseboard trim, backsplashes or shower heads. 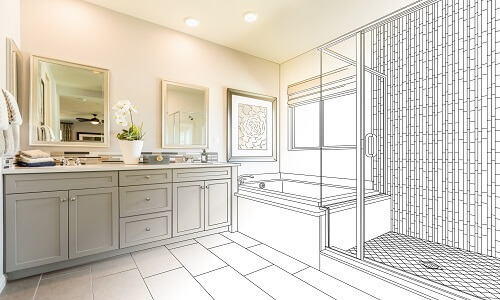 Imagine what you can do working with the existing layout of your bathroom or kitchen versus changing the design (as many home remodel projects involve relocating plumbing or electrical or walls). We have designers who can turn almost any vision into a reality. Start working on creating that picture of your remodeled home in your mind. Gather those ideas and images you’ve seen in newspapers, magazines, TV and on the internet so you can give us the clearest vision possible to work with. Step #2: Set your budget. Many homeowners are afraid to pursue their dream of home renovation because of their limited budget. Money plays an important role but it is not everything; not when your dreams are at stake. We will work with you to do the most possible within your budget. We will recommend alternative finishes, surfaces and other technical options to facilitate the amount you’re working with. Staying in the budget is as important to us as we know it is you. If a whole house remodel isn’t in the cards for now, as they can be quite expensive, but let’s see what we can do to give at least some of your home the facelift it needs or deserves. Part of how we keep your Elk Grove remodel costs down is by doing everything as efficiently as we can. Our management team plans everything carefully and makes a report of every dollar spent. By using the best tools, we enhance the productivity of our onsite crews. These practices help in keeping down the cost of renovation. This means that even those on a tight budget can get their homes renovated. Determine exactly how much money have to work with for your bath or kitchen or other addition or remodel. You might not be able to afford the elegance of marble, but you’ll find that working with the Monster Contractor Home Remodel of Elk Grove design team, you may be surprised at the options that are still open to you. Past clients have thanked us for our experience, efficiency, and forethought. Step #3: Work with our Design Team. Our Elk Grove design specialist will meet with you to provide in-home design consultation based on what you’re starting with and your budget. Monster Contractor Remodel wants to hear your ideas and plans for your bath or kitchen or other remodel. Our remodel designers will provide their expert advice on details and implementation for staying within your budget. This does not mean that your home will not be renovated according to your desires. Before starting the construction phase, our designers and architects will sit with you work with you until we you are satisfied with the design details and costs. Monster Contractor’s remodel staff will take all the required measurements, listen to your preferences for materials and options, to ensure the construction phase will run smoothly. Monster Contractor will provide you with a comprehensive estimate that covers all material and labor costs. Once we have your approval, we can start the permit process to begin work. Step #4: Finalize the Terms. Before work begins on your bathroom, kitchen pantry, room addition or other renovation, you will receive out written estimate for your project. We will also give you a timetable of how long we anticipate it will take from commencement to completion. Monster Contractor will provide you with a comprehensive estimate that covers all material and labor costs. Once we have your approval, we can start the permit process to begin work. We will work with your schedule and plan to begin your project when the timing is best for you and your family. Step #5: The Completing your Remodel. As your bath, kitchen, pantry or room addition is turned into what you envisioned, you will notice our dedication to quality and details. We invite your questions throughout the project progress. Feel free to discuss your renovation project with the manager in the office or the onsite supervisor and share any comments or concerns. Our experienced, professional, crews, supervisors and managers will do everything to make sure your project is finished on time. As you use your newly remodeled bath or kitchen, we will know that you are a satisfied customer. You will be happy knowing that Monster Contractor Remodel has your back with written warranties, quality craftsmanship and recognized brand materials. At Monster Contractor, we know that your satisfaction is crucial to our continued and growing business in Elk Grove. Why Pick Monster Contractor for your Remodel? Monster Contractor Home Remodel of Elk Grove. We are a general contractor whose specialty is residential remodel and construction. Our contractors have over 40 years combined experience throughout home improvement and construction needs such as carpentry, electrical, plumbing and drywall. Monster is founded on the principles of trust, authenticity, ethics and partnership and has built a reputation of excellence and honesty among Elk Grove clientele. If you’re looking to customize and existing room; remodel a bathroom or kitchen; add a new room addition or second story addition, Monster Contractor Home Remodeler in Elk Grove is the best choice among general contractors. We are faithful to our dogma of integrity and honesty within the construction industry. Honesty and open communication with our clients, plus our detailed pricing creates repeat business. Call Monster Contractor Home Remodeling of Elk Grove today at 916-550-4381. At Monster Contractor in Elk Grove, we take pride in our construction skills and quality. We believe our partnership with the client includes assisting them in realizing their vision for their business or home. We are devoted to hiring only licensed, experienced personnel with the most knowledge and qualifications in order to deliver exceptional service to our clients. Our customers’ happiness is the ultimate achievement in maintaining our high standards of customer service. Before starting any bathroom, kitchen, pantry, room addition or other remodel project or home improvement of any scale, you will need to get the required city permits and drawings. These are required any time you relocate structural walls, electrical wiring or plumbing, which is common in the majority of bathroom and kitchen renovations. It is best to have the structural drawings first. These will help save money on your project. What’s more, it is our recommendation that you make sure whatever contractor you employ has a valid California state contractor’s license, city license, and proper insurance. We understand your home is your most valuable asset and the remodel project needs to go off without a hitch. Any renovation to your home represents not only an upgrade to your living space but also a financial investment that you hope will later bring you a needed return. We strongly recommend that you keep an open mind and select your contractor not only for their price, but also for their quality and current CSLB licensing and insurance coverage status. You get what you pay for in construction. Cheap labor and workmanship will not last. Monster Contractor has all the required licensing and insurance and is here to help you with the drawings and permits process. Monster Contractor is a full-service General Contractor and Construction Company located in Elk Grove. We provide our industrial, commercial & residential clients with premier service and quality assistance throughout the greater Elk Grove area. We work hard to provide what seems to have been lacking in recent years: a contractor who wants to provide quality service at a fair price. As a result, many of our clients call us back year after year. Monster Contractor of Elk Grove is a fully licensed and insured construction company. Whether you need commercial, industrial or residential construction, we'll have our best journeymen on the project. We have over 50 years combined experience in the commercial construction and industrial construction industries. Our Property Maintenance experience, like electrical, plumbing, gutter cleaning, etc. will keep help your Elk Grove facility running smoothly. Commercial Tenant Improvement in Elk Grove is easy with us. Apartment building and property owners have trusted us for years to improve the lives of their tenants. From small projects to new builds, we have managed all types of Construction Management projects in and around Elk Grove, California. Retirement homes, government offices and apartment buildings are just some of the Facility Maintenance services we offer. We work directly with YGRENE and HERO on Green Building Construction and can be your ally on energy-proofing your property in Elk Grove. We have the best solutions for all aspects of home remodeling and Residential Construction in Elk Grove. Are you doing a Elk Grove Home Remodel? Room Addition? Kitchen Remodel? Whether it’s a bathroom remodel or complete or partial remodel, we can simplify your remodeling needs. Call Monsters Concrete for a complete estimate to repair foundations and other concrete products. We even have Home Maintenance and home cleaning solutions and can make ourselves available for the smallest detail. 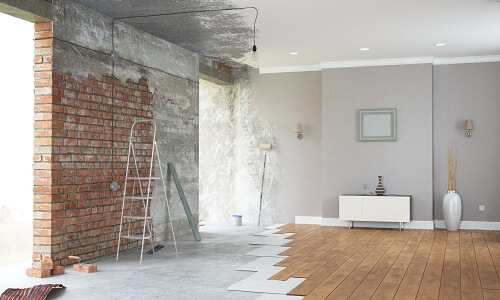 Earthquake Damage Restoration and retrofit as well as Fire Damage Restoration mitigation can be expensive if you’re not familiar with restoration in Elk Grove. Insurance Restoration and working with insurance companies is difficult. Let our experience simplify the process. Storm Damage Restoration can happen at any time of year. We offer services for each season. Water Damage Restoration from leaks can destroy your home. Fast comprehensive repair from Monsters Roofing is the best solution.